Rare aluminum body by O.J. Beaudette Co. of Pontiac Michigan. Ford referred to these cars as Pontiac bodies. I've heard between 200 and 1000 of these bodies were built with aluminum panels, before Henry decided it was too expensive and went back to wooden bodies. She's my first brass T in the 9 others I have owned. Built in June 1909 at the Piquette Plant in Detroit Michigan. Now home to the Piquette T's club, in the restored original factory at the corner of Piquette and Beaubien. 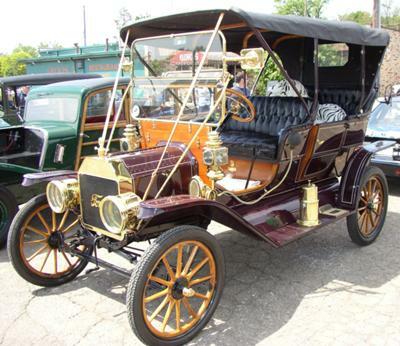 I hope to drive this 1909 T, back to her birth plant, which is about 30 miles from me. It will be the first time this Ford car will be back at that factory in 102 years. Where is the body number located? I have a 1909 Model T Ford that I am working on and it has an original aluminum panel body. Where can I find the body number if it still exists? Fine car - serial no & body no? I have an alloy bodied touring, build date Aug 17 1909. serial no 9267. Sadly the body no has been rubbed away when a previous owner painted the car. No one seems to have established what date range these bodies were made.